Retrieve your API Secret from Mixpanel. Retrieve any ID numbers or names relevant to your query from Mixpanel. Use Mixpanel API documentation to craft a query. Use your query to get Mixpanel data in Klipfolio. To create a data source using Mixpanel, go to the New Data Source page in Klipfolio and select Mixpanel. Open a new tab in your browser and log in to your Mixpanel account. Copy and save your API Secret. Mixpanel offers a variety of query options from which you can retrieve data. Refer to the Mixpanel Data Export API to find out more. A great way to get started is to copy the query examples below into Klipfolio Dashboard and fill in the blanks with your information. Then, try creating your own queries. Open the Funnel you would like to retrieve data from. Navigate to the URL and copy the Funnel ID and paste it into your query. For this example query, replace event names, for example Event1 with an event name in your Mixpanel account. Important! Sometimes events contain special charactes like #,~,* etc. If that's the case, you may have to URL encode the event names. Expand the Authentication (Oauth, 2 Step, X-WSSE, or Basic) menu. 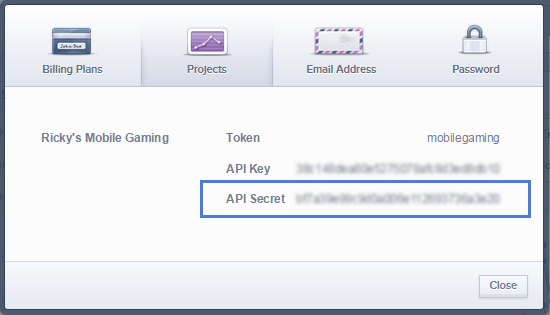 At Username enter your API Secret. At Password, leave the text box blank.